It’s time for the Droid Life Smartwatch Showdown. Not really, but over the next few days, Kellex and myself will be playing with these new toys and seeing if we can get into this whole new phenomenon where even a person’s watch needs to be connected to their phone. Kellex will be handling the Pebble and I have the Metawatch STRATA. So let’s dive into it. The sleeve that goes over the box that holds the watch is your typical packaging. Simple picture of the watch with some logos and nothing special. After opening the all-black box that the watch is stored in, you find just the watch itself, USB charger, and a small brief instructional guide. Being the person I am, I quickly threw the guide out the window and dove right into the watch. 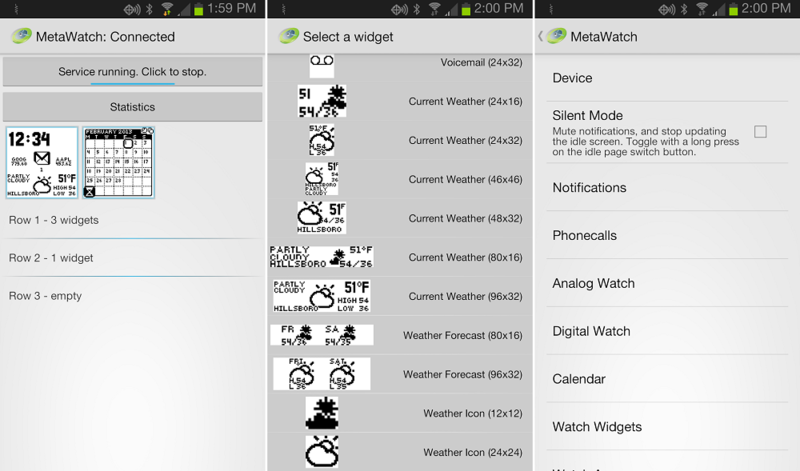 The Android community has already built a few great apps and plugins for the Metawatch and more are sure to come. This software ranges from additional themes for each icon the device supports, stock apps, and even little screensavers that remind me of Nyan Cat. Sure, the screen saver is basically worthless, but it’s cute. Hooking it up to my phone was easy enough. After turning on my Bluetooth, the phone easily found the device and I entered in the super secure “0000” password. Once connected, you are ready to customize the look of the watch. There is an official Metawatch app for Android from their team, but it doesn’t support many third party apps and plugins, so if you get one, go for the Community Manager app. Right from the app’s homescreen, you can set which widgets you want shown, what app pages you want, and can change every other setting the watch offers. In terms of what the watch can offer, the list is quite extensive. 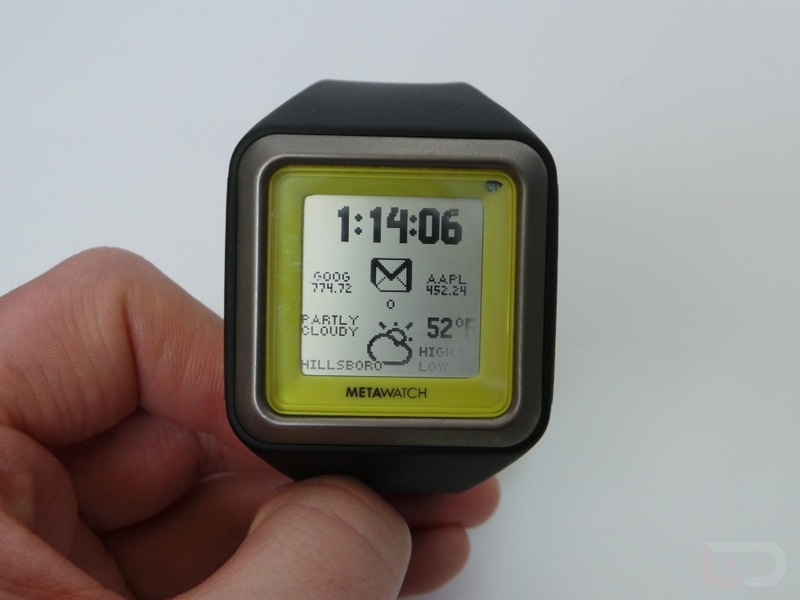 Much like the Pebble, it shows you notifications for emails, texts, and phone calls. Since I’m still learning how to work the device, I am still trying to figure out how to read individual texts and emails or if that’s even a possibility. Starting to wish I read that starter’s guide. Oh well. The watch has six buttons on its sides. Three on each. One lights the LED that illuminates the face, making viewing at night or other poorly lit areas (my cave) much easier. Others control which app you are using. For example, I have a page dedicated to my Music app. I can control my playlists, start/stop music, skip tracks, and all of that jazz right from the watch, which is a fantastic feature when my hands are full while walking the monsters. In terms of being a watch, it feels pretty nice on my wrist and usually, I am pretty picky about my watches. When switching through pages, there seems to be a little lag after a button is pressed, but it’s nothing that I can’t get over. All in all, after a single day’s usage, I am very impressed. Over the next few days, I will be putting it through the paces and will see if it can keep up. They are already on sale through their site for $179. Kind of pricey if you aren’t using it to its full potential.